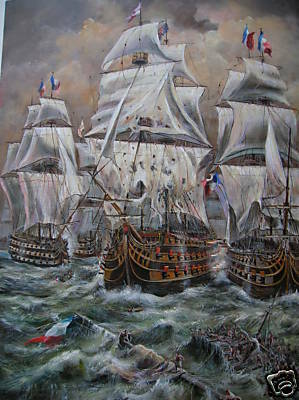 TRULY MAGNIFICENT OIL ON CANVAS "The Battle of Trafalgar ". BY THE FABULOUS ARTIST DAVID ALDUS. .......................... ( Highest price received for one of his paintings is £14,000 !! "Lot's Wife" Absolute investment opportunity! ) This beautiful classic painting capturing a terrifying historic moment at the infamous battle of Trafalgar 1805. Nelson in this painting was minutes from death as he charges through, in the centre ship Victory. To the right of the Victory is the french ship Redoutable which is laden with snipers in the rigging. Both ships Victory and the Redoutable veer away from the sunken french ship in the foreground. Not to avoid the men but to avoid damage to their hulls. Some macabre details of ship warfare are present in this painting and were used extensively during battles between wooden ships .It can be seen that the Victory has red tarpaulin edging their decks. This was supposedly used to protect snipers standing on deck, but it's main, undisclosed reason was to conceal the blood of those who were killed -sometimes numbered in their hundreds. Exactly the same ploy has been used mid-decks. The interior walls would be painted red and, as can be seen, the inner sides of the portals were also painted red!!!! Other facts from the battle-No english ship was lost,Nelson's ships were veritable killing machines.Unlike other navies Nelson's ships were feared as they would fire as the ships dipped so firing into enemy ship's hulls killing all. Other Navys would aim at ships sails to disable them. The bow of the Victory is not how you can see it today at Portsmouth as the ship was badly damaged at Trafalgar so has since been repaired with the bow as it exists today !!! The Fighting Temeraire is also in the painting to the left of Victory, in fact she provided covering fire to the left flank. The Temeraire was a french ship stolen by the English in previous battles and re-named the Fighting Temeraire. The ship to the far left is Villeneuve's flagship the Bucantaure which surrendered to give Nelson his famous Victory. Nelson's Victory can cleary be seen damaged as Nelson insisted he was the first ship into battle telling all other english battleships to get back behind him. Sadly here the one eyed ,one armed hero was gunned down but will be forever remembered.................................................................... Measurements height 24 inches by 16 inches. Oil on canvas. .